If you’re looking for a super fast and effective workout, you’ll want to consider adding jump roping to your fitness routine. It’s an exercise technique that can be carried out with a minimum of equipment and space and will give you heart and muscles a real workout. There’s no need for fancy clothing or a gym membership when you jump rope for fitness. Plus, jumping rope is a great stress reliever that can bring back memories of happy days spent jump roping as a child. Jumping rope is an excellent cardiovascular exercise that burns around 300 calories in 30 minutes when performed at a moderate pace. It’s a great way to develop endurance, increase aerobic capacity, tone the muscles of your lower body, and lose weight with a single exercise. Before you begin your jump rope fitness routine, it’s important to select the right equipment. You’ll need a good pair of athletic shoes, preferably a cross-trainer with extra support for the ball of the foot. This is important for preventing excess strain on the joints from the repetitive activity. You should select a jump rope of appropriate length for your height. Some jump ropes are weighted which are probably best avoided since they can be rather difficult to manipulate, particularly for a beginner. Ideally, you should be able to test out your jump rope in the store before purchasing it. It’s important that you feel comfortable with your selection before leaving the store. Discuss the different options with your sporting goods dealer and have him help you choose the best jump rope for your height and build. There are a variety of jump rope moves you can do, but it’s probably best to stick to the basic jump in the beginning. The basic jump is performed by bringing the rope over your head and jumping once with bent knees for each turn of the rope. You can vary the pace of the basic jump based on your fitness level with the goal of picking up speed over time. You should land lightly on the balls of your feet with knees bent slightly. Try to maintain a steady rhythm, staring straight ahead while you jump. Don’t look down at your feet. 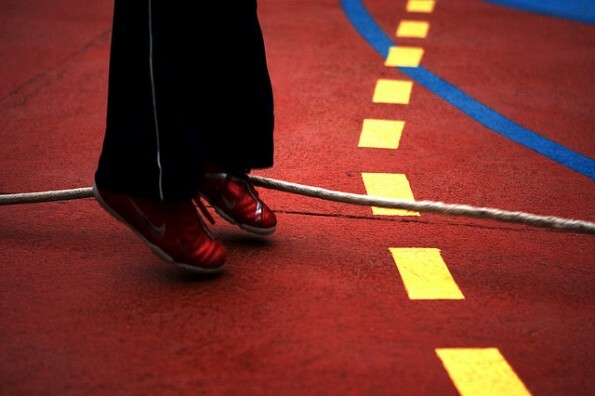 Start out jump roping for 10 minutes at a slow pace and gradually work up to 30 minutes at a more rapid pace. There are a variety of ways to make your jump rope fitness routine more interesting. You can play lively music in the background which motivates you and helps the time pass more quickly. Try playing fast paced, silly songs while your jump rope or recite some of your favorite childhood jump roping chants. You can also jump rope while you watch your favorite television show once you have your form down. A jump rope routine can give you increased stamina and a taut, toned body. Why not give this fun fitness idea a try?